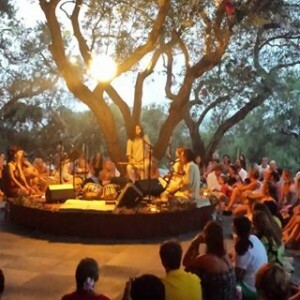 Sound and Silence Festival is a cozy little gathering with music, yoga and meditation in Portugal. “Welcome to the Sound & Silence Experience! We invite you to join us on an odyssey deep into the heart space, beyond the senses, into the precious nature of paradise and among your awaiting conscious community. This is no ordinary gathering. In fact, at one point, we even called it a festival, because indeed we are celebrating this sweet life. However, we soon realized that this was more than a festival – it has become a living retreat, a gathering of heart-centered beings from all walks of life who come together to radiate love and share moments of sheer joy and captivating experiences. The fest will have music, theater, artists and healers who will contribute in their own special way to enlighten the visitors. In addition, there will guided meditation and healing music for those searching for Nirvana. During the 5 days on this island, one will get to go to various workshops, enjoy the vegetarian meals and participate in musical satsangs. For more on the Sound and Silence Festival in Portugal.